A bacterium isolated from Sterkfontein dam was confirmed to produce bioflocculant with excellent flocculation activity. The 16S rDNA nucleotide sequence analyses revealed the bacteria to have 99% similarity to Streptomyces platensis strain HBUM174787 and the sequence was deposited in the Genbank as Streptomyces platensis with accession number FJ 486385.1. Culture conditions for optimal production of the bioflocculant included glucose as a sole carbon source, resulting in flocculating activity of 90%. Other optimal conditions included: peptone as nitrogen source; presence of Mg2+ as cations and inoculum size of 1.0% (v/v) at neutral pH of 7. Optimum dose of the purified bioflocculant for the clarification of 4g/L kaolin clay suspension at neutral pH was 0.2mg/mL. Energy Dispersive X-ray analysis confirmed elemental composition of the purified bioflocculant in mass proportion (%w/w): carbon (21.41), oxygen (35.59), sulphur (26.16), nitrogen (0.62) and potassium (7.48). Fourier Transform Infrared Spectroscopy (FTIR) indicated the presence of hydroxyl, carboxyl, methoxyl and amino group in the bioflocculant. The bioflocculant produced by S. platensis removed chemical oxygen demand (COD) in river water and meat processing wastewater at efficiencies of 63.1 and 46.6% respectively and reduced their turbidity by 84.3 and 75.6% respectively. The high flocculating rate and removal efficiencies displayed by S. platensis suggests its industrial application in wastewater treatment. Streptomycetaceae is a family of Actinobacteria, which constitute the monotypic suborder Streptomycineae. Streptomyces are gram positive, aerobic, spore forming microorganism and they are found majorly in soil sediment and marine environment. The presence of linear chromosomes which is responsible for exchange of information is peculiar to this bacteria.10 According to literature, Streptomyces platensis has found biotechnological application due to the production of a novel anti-migrating agent called migrastatin. In addition, the antibiotics that are produced by this organism have the ability to target specific enzymes.11 Actinomycetes producing bioflocculants have been implicated in flocculation. However, there is no report in literature confirming the industrial application of this strain in the treatment of wastewaters. Hence, in this paper we evaluated the culture conditions and establish the application of bioflocculant produced by S. platensis in river water and wastewater treatment. The Sterkfontein Dam (28°24′31.2″ S 029°02′15.0″ E.) is located just outside the town of Harrismith, in the Eastern Free State Province of South Africa. The Dam is part of the Tugela-Vaal Water Project located on the Nuwejaarspruit, a tributary of the Wilge River in the upper catchment area of the Vaal River. The water sample was collected from the dam aseptically into a sterile air-tight bottle. The bottle was kept in a cooler box containing Ice Pack and was transported to the laboratory for processing. Serial dilutions were done and cultivation of actinomycetes from the processed water sample was done according to the method described by Jensen and co-workers12 using Yeast Malt Extract agar (YMA) supplemented with 50mgL−1 cyclohexamide and 20mgL−1 nalidixic acid to inhibit the growth of fungi and bacteria respectively. The composition of the media includes 0.4% yeast extract, 1% malt extract, 0.4% glucose and 1.6% of bacteriological agar in distilled water. An aliquot of 100μL of the sample was spread over the cultivation medium and incubated at 28°C for one to two weeks. After the incubation period, typical colonies were purified by streaking on fresh YMA plates and purified colonies were stored on YMA slants in 20% glycerol at −80°C in the freezer. Total number of fifteen isolated actinomycetes strains were screened for bioflocculant production in accordance with the protocol of Xia and co-workers13 with adaptation. The isolates were inoculated into McCartney bottles containing 5mL of screening medium and incubated for 48h on a rotatory shaker at 30°C and 160rpm. The composition of the screening medium was 2% glucose, 0.05% urea, 0.05% yeast extract, 0.02% (NH4)2 SO4, 0.01% NaCl, 0.02% MgSO4·7H2O, 0.5% K2HPO4 and 0.2% KH2PO4 in distilled water. This pre-culture procedure was then used as the standard inocula preparation for subsequent experiment. A McCartney bottle containing 5mL production medium was inoculated with 100μL pre-culture of the strain and incubated at 25°C in a rotatory shaker (Inco shake, Labotec) at 130rpm for 48h. The production medium composition include 1% glucose, 0.1% peptone, 0.03% MgSO4·7H2O, 0.5% K2HPO4 and 0.2% KH2PO4 in distilled water. The initial pH of the medium was adjusted to 7.0 with NaOH (0.1M) and HCl (0.1M). After incubation, cell free culture supernatants were used to determine bioflocculant production against kaolin clay suspension. Finally, the strain that displayed highest flocculating efficiency was selected for further investigation. where A and B are the respective absorbance of the sample and control experiment at 550nm. The genomic DNA of actinobacteria was extracted using a ZR fungal/bacteria DNA preparation kit according to the manufacturer's instructions. The 16S rRNA gene was amplified by using universal primers 27f: (5′-GAGTTTGATCCTGGCTCAG-3′) 1492r: (5′-GGTTACCTTGTTACGACT-3′).14 PCR amplification was carried out in 20μL reaction volume containing 10μL of Econo PCR master mix, 1mM of each primer, 1μL of template DNA. Sterile 8μL distilled PCR grade water was added to a final volume of 20μL. PCR programme used was an initial denaturation (94°C for 5min), 45 cycles of denaturation (94°C for 30s), annealing (55°C for 30s), extension (72°C for 1min, 30s) and final extension for (72°C for 10min). Thermoscientific thermal cycler PCR machine was used to run the reaction. PCR products was electrophoresed on 1% agarose gel in 1× Tris Borate EDTA buffer stained with gel red and was visualized under UV transilluminator to confirm that a fragment of the correct size had been amplified. Automated sequencing of 16S rRNA genes of the organism was done using the sequencer AB 35,100×L genetic analyzer with 24 capillaries. Sequencing reactions was performed according to the manufacturer's protocol using Big Dye version 3.1 dye terminator cycle sequencing kit (Applied Biosystems) with 27f and 1492r primers. Sequences was aligned in the Gene bank database using the BLASTN program at the National Centre for Biotechnology information (NCBI) and percent homology score was obtained to identify the organism. The purification was done according to the method employed by Chen15 and Piyo16 with modification. After 72h of fermentation, the culture broth was centrifuged at 8000×g for 30min to remove bacteria cells. One volume of sterile distilled water was added to the supernatant phase and centrifuged at 8000×g for 15min to remove insoluble substances. Two volumes of ethanol were later added to the supernatant, stirred and left to stand for 12h at 4°C. The precipitate was vacuum-dried to obtain crude bioflocculant. The crude product was dissolved in water to yield a solution, to which one volume of a mixed solution of chloroform and n-butyl alcohol (5:2, v/v) was added. The mixture was stirred, poured into separating funnel and allowed to stand for 12h at room temperature. Finally, the supernatant was discarded and two volumes of ethanol were added to recover the precipitate and then lyophilized to obtain a purified bioflocculant. Initial pH, Cations, carbon and nitrogen sources, inoculum size and thermal stability were the parameters investigated for optimum bioflocculant production in our test isolate. The flocculating efficiencies of polyacrylamide, polyethylenime, alum, ferric chloride and the test bioflocculant on kaolin clay suspension were investigated according to the protocol of.20 In order to compare the coagulation performance of synthesized flocculants and the purified bioflocculant, each flocculant was prepared at a different concentration with the addition of cations that stimulates flocculation processes and tested against kaolin suspension using the jar test. The control experiment was prepared in the same way but the flocculants (chemically synthesized or bioflocculant) was replaced with distilled water. The residual flocculating activity were measured as earlier discussed. where A0 is the initial value and A is the value after the flocculation treatment. The total protein content of purified bioflocculant of S. platensis was determined by Lowry's method using bovine serum albumin (BSA) as a standard.21 Lowry solution which is the composition of A [2.85g NaOH & 14.3g Na2CO3], B [1.42g CuSO4·5H2O] and C [2.85g Na2Tartarate·2 (H2O)] were prepared separately in distilled water and the solutions were mixed together in a ratio (vol:vol) of 100:1:1. BSA standard was prepared by weighing 0.05g of BSA in 500mL distilled water, stirred and final concentration of the stock was adjusted to 100mgBSAL−1. The stock BSA solution and dilutions were used to prepare the standard curve. The sample was prepared in triplicates the same way the standard was done, well mixed and 0.5mL was transferred into a glass tube. After, 0.7mL of Lowry solution was added, vortex and incubated for 20min at room temperature in the dark. A volume of 0.1mL of diluted folin reagent were later added to each tube, vortex and incubated for 30min at room temperature in the dark. The sample was later transferred into cuvette and the absorbance of the sample and the standard were measured at absorbance of 750nm. The calibration curve from the absorbance reading of the standard was prepared and the protein content of the sample in mgBSAL−1 was calculated from the curve. Total sugar content of bioflocculant was determined by phenol sulfuric method using glucose as a standard solution.22 Working standard solution was prepared by dissolving 100mg of glucose in 100mL of distilled water and 10mL was taken from the stock and further diluted to 100mL. The standard was prepared by taking 0, 0.2, 0.4, 0.6, 0.8 and 1mL of the working standard into a series of test tubes and 0 serves as the blank. The volume was made up to 1mL in all tubes including the sample tubes by adding distilled water. A volume of 1mL of phenol solution was added to each tube and 5mL of 96% sulphuric acid was later added and shaken thoroughly. The contents in the tubes were later shaken after 10min and placed in water bath at 25–30°C for 20min. The absorbance was measured at absorbance of 490nm and the amount of total carbohydrate present in the sample solution was calculated from the standard graph. The functional groups of purified bioflocculant were analyzed using Fourier Transform Infrared Spectrophotometer (Perkin Elmer System 2000, England). The bioflocculant was ground with potassium bromide salt at 25°C and pressed into a pellet for FTIR spectroscopy at the frequency range of 4000–370cm−1. Thermo-gravimetric analysis was done using a TGA analyzer (STA 449/C Jupiter, Netzsch, Germany Perkin Elmer TGA7 Thermo gravimetric Analyzer, USA) over a temperature range of 20–900°C at a heating rate of 10°C/min under a constant flow of nitrogen gas. The purified bioflocculant sample placed on a carbon coated stub were gold coated in a gold coating chamber, using Eiko IB3 ION coater, afterwards, the scanning electron microscopic image of the bioflocculant was obtained using a JEOL JSM-7800F FE-SEM with an Oxford SDD X-Max EDS System which was used to analyze the elemental composition of the purified bioflocculant. Results were expressed as means±standard deviation of three replicates and were subjected to one way analysis of variance (ANOVA) followed by Duncan multiple range tests to determine significant differences in all the parameters using SPSS 16.0. Values were considered statistically. Following 72h of fermentation under optimal culture conditions and composition, 4.61g of pure purified bioflocculant was obtained from 1L of culture broth. The flocculant secreted by S. platensis had polysaccharide (83%) and (4.6%) protein as its major constituents. Fifteen strains of actinomyces isolated from water sample, collected from Sterkfontein dam producing bioflocculant were selected on the basis of flocculating activity exceeding 70%. Among the selected strains, SFD 20 exhibited the highest flocculating activity of over 90% and was used for further studies. The 16S rDNA PCR yielded a product of expected size (approximately 1.5kb). Basic Local Alignment Search Tool (BLAST) analysis of the nucleotide sequence of the 16S rDNA revealed the bacteria to have 99% similarity to Streptomyces platensis strain HBUM174787 and the sequence was deposited in the Genbank as S. platensis with accession number FJ 486385.1. Fig. 1A reveals the bioflocculant production potential of S. platensis utilizing different carbon sources. Glucose, sodium carbonate, phthalate and sodium acetate appeared to support cell growth and bioflocculant production at a flocculating activity of over 60%, with glucose showing the maximum activity (90%) as a carbon source. On the other hand, maltose, xylose and lactose were poorly utilized by the bioflocculant production of the test organism. 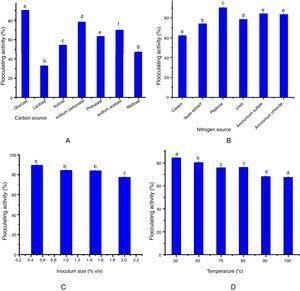 Effect of various sources (A) carbon sources, (B) nitrogen sources (C) inoculum size, and (D) temperature on the flocculating activity of Streptomyces platensis. Percentage flocculating activities with different alphabetic letters are significantly different p<0.05. Data obtained with respect to the impact of nitrogen sources on bioflocculant production by the test organism in this study revealed that the organic (yeast extract and peptone), and the inorganic (urea, ammonium sulfate and ammonium chloride) nitrogen sources supported the growth and bioflocculant production with peptone eliciting the most prominent flocculating activity (90%) (Fig. 1B). The effect of pH of the medium (at the range of 3–12 scale) on bioflocculant production is shown in (Fig. 2A). Our results showed that the optimum bioflocculant production was observed at the neutral pH 7. It is noteworthy that the basic medium supported the growth of the organism at an average flocculating activity of 55% compared to the weakly displayed activity at the acidic medium (Fig. 2A). Effect of (A) pH on bioflocculant production, and (B) concentration on flocculating activity of purified bioflocculant produced by Streptomyces platensis. Percentage flocculating activities with different alphabetic letters are significantly different (p<0.05). The results of the effect of metal ions on the flocculating activity of S. platensis are presented in Table 1. Of the cations investigated in this study, the divalent cations appeared to support bioflocculant production with flocculating activity of over 74% (74.57–91.05%) and optimum activity of 90% was observed when MgCl2 was utilized. On the other hand, the monovalent ions partially supports flocculating activity exceeding 64% (64.74–71.15%). Also, Al3+ as a representative of trivalent cation enhanced the flocculating activity at 83% while, Fe3+ resulted in a weak flocculating activity of 58% as shown in Table 1. Effect of cations on flocculating activity. Percentage flocculating activities with different alphabetic letters are significantly different (p<0.05). The data on the effect of inoculum size on bioflocculant production by S. platensis revealed that the optimum flocculating activity was attained at 1% (v/v) inoculum size. Further increase in the inoculum size led to a steady decrease in the flocculating activity (Fig. 2C). Fig. 2D shows how thermally stable and the influence of heat treatment on the bioflocculant activity. Although, a temperature-dependent decrease was observed following the heat treatment, the flocculating activity of the bioflocculant culture broth was maintained at around 70% over the entire treatment conditions (50–100°C) for 25min. Fig. 2B illustrates the coagulant dosage ranging from 0.1 to 1.0mg/mL. Optimum flocculating activity of 94.88% was recorded when 0.2mg/mL coagulant dosage was used to flocculate kaolin clay. In contrast, further increase in dosing with the bioflocculant from 0.3mg/mL to 1.0mg/mL resulted in decreased removal of turbidity and flocculating activity. The flocculation efficiency of conventional flocculants (polyaluminium chloride, polyethylemine, ferric chloride and alum) and the purified bioflocculant against kaolin clay suspension at a varying concentrations (0.1–1.0mg/mL) is presented in Table 2. The results revealed that the purified bioflocculant was significantly efficient at the optimum concentration (0.2mg/mL) when compared with 0.3, 0.8 and 1.0mg/mL for polyethylemine, alum and ferric chloride, respectively. Polyacrylamide as an inorganic flocculant was able to flocculate kaolin clay suspension at an optimum concentration of 0.1mg/mL and there was no significant difference (p>0.05) in its flocculating activity when compared to the test bioflocculant (Table 2). Comparison of efficiency of bioflocculant and chemical flocculants. Percentage flocculating activities with different alphabetic letters are significantly different (p<0.05). The physico-chemical properties of untreated river and meat processing waste water are shown in Tables 3 and 4 presents the flocculating efficiency of the purified bioflocculant on river and waste water. It was observed that the bioflocculant could flocculate the river water better than the waste water with efficiency, COD removal, and turbidity removal values of 91.4%, 63.1% and 84%, respectively when compared with 82%, 46.6%, and 75.6% for the waste water at 0.2mg/mL. However, the bioflocculant could remove suspended solids in meat processing waste water better than river water at percentage removal of 72.8% and 60.2% respectively. Physicochemical properties of untreated river and meat processing waste water. The values are means of triplicate determinations. Flocculation of river water and wastewater. The values are expressed as means±SD of triplicate determinations. The results of the FTIR, scanning electron microscopy, and the TGA analyses of the purified bioflocculant are presented in (Figs. 3–5) respectively. Peaks corresponding to different functional groups at stretching vibration range of 628.8–3417.4cm−1 were evident from the FTIR spectrum (Fig. 3). While the purified bioflocculant appeared whitish in nature with an agglomerate of oval shape filled with scattered stains Fig. 4A, the interaction of the bioflocculant and the kaolin clay suspension resulted in the formation of compacted flocs (Fig. 4B). From the TGA analysis, while about 20% loss in weight in the temperature range of 20–150°C was observed in the purified bioflocculant, there was a gradual decomposition of the material at temperature range of 150–450°C. Over 60% weight was retained after heating the material at 900°C (Fig. 5). Further elemental analysis by EDX indicated C – 21.41; O – 35.59; N – 0.62; S – 26.16; and P – 7.48%, w/w as the major constituents of the purified bioflocculant. 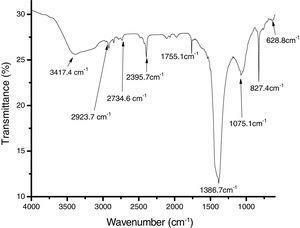 Fourier-transform infrared (FTIR) spectroscopy of purified bioflocculant produced by Streptomyces platensis. Scanning electron micrograph of (A) purified bioflocculant, (B) purified bioflocculant flocculating kaolin suspension, (C) Kaolin powder suspension. Thermogravimetric analysis and Energy Dispersive X-ray analysis of purified bioflocculant. The higher yielded purified bioflocculant suggested a higher productivity in bioflocculant produced by our test organism within a short period of time as compared with other strains that has been reported in literature. In contrast to our findings, 3.8gL−1 of biopolymer was produced by Ochrobactrum ciceri W2,23 while 2.43g of purified bioflocculant was recovered from the culture broth of Virgibacillus sp.24 The flocculant secreted by S. platensis was mainly polysaccharide (83%) and (4.6%) protein. The effect of initial pH of the medium on bioflocculant production is shown in Fig. 2A. Xia13 reported that initial pH of the culture medium influences the electric charge and the oxidation reduction potential of the cells, which can also affect nutrients absorption and enzymatic reactions. The effect of pH was investigated at the range of 3–12 and optimum bioflocculant production was observed at the neutral pH 7, which reduces the quantity of acids and alkali needed to adjust pH. However, basic medium also seems to support the growth at flocculating activity of over 60% compared to weak flocculating activity observed at acidic medium. The poor flocculating activity at the acidic medium could be attributed to excessive concentration of hydrogen ions that alters the electric charge. This finding corroborates the report of Giri29 and Gong17 where optimum bioflocculant production by B. subtilis F9 and Serratia ficaria was attained at neutral pH. However, the effect of pH conditions on bioflocculant production varies with different strains, operational conditions and composition of the medium.31 For instance, pH range of 7–12 favoured bioflocculant production by Bacillus megaterium and maximum activity was attained at pH 9.0.32 In another study, optimum bioflocculant production by Achromobacter sp. was attained at a weak acidic pH 6.28 On the other hand, the bioflocculant produced by Virgibacillus sp. with flocculating activity of 85.8% was attained at the pH 10. Cations enhance the initial adsorption of bioflocculants on to the surface of the suspended particles, thereby minimizing the negative charge on the polymer and the particles.33 Yim34 reported that contribution of metal ions to the flocculating activity of a bioflocculant could be due to neutralizing and stabilizing the residual charge of functional groups and then forming bridges between particles. The weak flocculating activity of Fe3+ in the present study is consistent with its inhibitory role against the flocculating activity of the flocculant from the test organism. Our submission is in agreement with the report of Okaiyeto35 and Ugbenyen26 where the flocculating activity of bioflocculant produced by two Bacillus spp. were both inhibited by Fe3+. Furthermore, the significantly higher value shown by the Mg2+ is not only suggestive of its neutralizing and stabilizing effect on the charge of functional groups of the flocculant but is also consistent with previous assertion36 where Mg2+ enhanced the flocculating activity of the bioflocculant produced by Streptomyces sp. The inoculum size is an important parameter that enhances better flocculating activity of cell growth. Reports have demonstrated optimum and facilitated flocculating activity of the test organism when inocular size of 1% (v/v) are used and this is in agreement with the result of our finding in this study. Specifically,17,34,37 have earlier implicated inoculum size of 1% (v/v) in facilitating maximum flocculating activity in bioflocculant produced by S. ficaria, Bacillus licheniformis and for the multi-microorganism consortia containing Staphylococcus sp. and Pseudomonas sp. Contrary to these findings, highest flocculating activity was recorded when inoculum size of 2% (v/v) was used in the bioflocculant production by A. flavus and Brachybacterium sp.27,38 It has been established that large inoculum size results into overlapping of niches, thereby hindering bioflocculant production.2,39 This is well illustrated in the present study where the best and enhanced activity was observed at the lowest investigated inoculum size contrary to the relatively attenuated activity at the higher inocular sizes. The significantly displayed heat stable tendency and flocculating activity (70%) by the produced bioflocculant from S. platensis over the different treatment conditions could be attributed to the fact that the main backbone is a polysaccharide. This finding corroborates the report of Giri29 whereby the bioflocculant produced by B. subtilis is composed mainly of polysaccharides. Consistent with our report, the consortium of Cobetia sp. and Bacillus sp. retained its residual flocculating activity of 87% after heating at 100°C for 25min.20 Likewise, bioflocculant produced by A. flavus was thermostable, retaining 90% flocculating activity within the temperature range of 10–100°C. Optimization of coagulant dosage in the treatment of water is important in order to achieve maximum turbidity removal and flocculating efficiency at a cheaper cost. In this study, the enhanced flocculating activity at 0.2mg/mL coagulant dosage suggests that the initial dose of 0.1mg/mL used may be considered insufficient and ultimately caused incomplete and inefficient coagulation. Although, this report is contrary to the findings of Cosa24 and Wang40 where optimum dosage employed to achieve maximum flocculation was 0.1mg/mL and 12mg/mL respectively, it has established an optimal dosage regimen (0.2mg/mL) for the bioflocculant from the test organism. This variation in dosage could be as a result of charge reversal and destabilization of colloidal particles.41 Overdosing or insufficient dose would lead to poor performance of coagulant during the process of flocculation. Hence, validating and establishing the optimum dose needed at a particular time in treatment of portable water and wastewater in order to reduce cost of production, minimize the risk of overdosage in human beings and minimize formation of sludge in water treatment is imperative.42 This was the singular reason for the assay in this study. The relatively good and significant flocculating efficiency of the purified bioflocculant against kaolin clay suspension and waste water treatment in this study may be ascribed to its inherent constituents and thermally stable nature. Consequent upon this, it may be inferred that the S. platensis bioflocculant may serve as a good replacement for conventional flocculants in wastewater treatment and fermentation industries. The overall significant bioflocculating efficiencies exhibited in this study have demonstrated that the bioflocculant from S. platensis possesses high flocculating activity in kaolin suspension. However, to be applied in treatment of water, the performance of the bioflocculant should also be assessed in river water and wastewater. The river water is a representative of surface water with less COD and turbidity17 and the results of our evaluations on the river water in this study was quite interesting and of significant importance judging by previous reports. Gong17 reported that the flocculant of S. ficaria flocculated river water at an efficiency of 90.4% with COD and turbidity removal efficiencies of 87.1% and 84.2%, respectively. In another study, maximum COD and turbidity removal of 61.2% and 95.6% were achieved when a bioflocculant produced by B. licheniformis X14 was used to treat low-temperature drinking water.37 In addition, the industrial application of bioflocculant produced by S. platensis was also evaluated on meat processing wastewater and its turbidity removal efficiency may be attributed to polymer-floc interaction of the bioflocculant, which leads to increase in agglomeration of particles. On the other hand, bioflocculant produced by Azotobacter indicus was able to reduce biological oxygen demand (BOD), COD and suspended solids in wastewater samples in the range of 38–80%, 37–79% and 41–68% respectively at a bioflocculant dosage of 500mgL−1.43 Our findings confirmed the possibility of the use of the bioflocculant in flocculation processes. The FTIR spectrum of the purified bioflocculant analyzed revealed the presence of different functional groups. While the band with the peak at 3417.4cm−1 can be assigned to the stretching vibration of hydroxyl and amino groups,44 those at 2923.7cm−1, 2734.6cm−1 and 2395.7cm−1 indicated aliphatic CH bands. The peak at 1755.1cm−1 is characteristics of CO stretching vibration in carboxylic group and the intense peak at 1386.7cm−1 is a representative of CN stretching group.45 The peaks at 827.4cm−1 and 628.8cm−1 are known to be characteristics of sugar derivatives and β-glycodisic bonds between sugar monomers.25 The presence of hydroxyl, amino, carboxyl group present in the IR spectrum of S. platensis might be responsible for the significant and excellently elicited flocculating activity in this study. During the process of flocculation, kaolin clay adsorbed on to the binding sites of bioflocculant which resulted into larger flocs formation and sedimentation of the kaolin particles. This was evidently shown in this study with the interaction of the purified bioflocculant and the kaolin clay suspension forming compacted flocs (Fig. 4B) as against both the purified bioflocculant alone (Fig. 4A) and the kaolin clay suspension (Fig. 4C). The thermogravimetric analysis was conducted to monitor the pyrolysis profile of the test bioflocculant. The over 60% weight retained following heat treatment of the purified bioflocculant at the highest treatment temperature (900°C) was an affirmation of the thermally stable nature of the bioflocculant. The elemental constituents revealed by the EDX analysis are a further attestation of the confirmed chemical constituents of the purified bioflocculant to be rich in polysaccharides and proteins. The bioflocculant produced by S. platensis SFD 20 is composed of mostly polysaccharide with the addition of proteins. This feature contributes to its thermostability. The purified bioflocculant had a high flocculating activity at a minimal dosage requirement, against kaolin clay, river water and meat processing wastewater. The bioflocculant could also remove COD and turbidity in meat processing wastewater and river water. Based on the outstanding performance of the test bioflocculant, it could be a useful tool in environmental bioremediation and other biotechnological processes. Moreover, further studies will focus on evaluating the ability of the purified bioflocculant to flocculate other wastewaters and remove heavy metals. Financial support from the National Research Foundation of South Africa (Grant No. 94923) is highly appreciated. Characterization of an exopolymeric flocculant produced by a Brachybacterium sp.